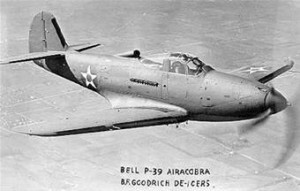 At 10:45 a.m., on February 15, 1942, 2nd Lt. Harry L. Mathews, 24, took off from Bridgeport Municipal Airport in a Bell P-39C, (Ser. No. 40-2972), for an aerobatic training flight over the area. After circling the field once he called for landing instructions and was given instructions to land on the east-west runway from the east. After completing another half-circle of the airport the plane fell about one-and-a-half miles from the airport coming down in an area known as Lordship marshes, in the Lordship Village section of Stratford. The first to arrive at the crash site were members of the Lordship Volunteer Fire Department, who raced from their fire station about a quarter of a mile away. There they found Lt. Mathews had been killed in the crash. A woman who witnessed the crash from her home at 491 Washington Parkway, Lordship, told reporters that the plane’s engine was sputtering, and as it was in a left turn about 100 feet above the ground it suddenly fell to the marsh landing on its left wing and nose. There was no fire afterward. The accident was blamed on mechanical failure with the aircraft’s engine. Lt. Mathews, of Gates, North Carolina, was survived by his wife, Mary, whom he had married only two months earlier on December 18, 1941. Prior to entering the Air Corps in April of 1941, he graduated Wake Forest College, and had been a school teacher. He received his basic flight training at Randolph Field, Texas, and graduated from Pursuit Training School at Victoria, Texas, December 12, 1941. At the time of his death he was assigned to the 61st Pursuit Squadron. Unknown Newspaper, “Flier Killed In Stratford”, unknown date.